Andorra is a small country nestling high in the Pyrenees that has been independent since 1278. The average altitude of Andorra is the highest of all the countries in Europe; with its deep snow, brilliant sunshine and despite, at times, hostile weather it can be the most beautiful country on earth. Although not possessing any militaristic ambitions itself, the country has seen its neighbours invaded on many occasions. Many WW2 Allied escapers and evaders, together with escaping Jews and French civilians, found themselves within the borders of the small, neutral environs of Andorra whilst outwitting their pursuers throughout Europe. It was not an easy route, preferably undertaken with guides although they were not a guarantee of safety as the lives of many evaders and their guides were claimed by the treacherous conditions on the 8000ft peaks that did not discriminate between experienced men and amateurs, or friends and foes. 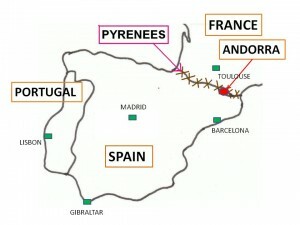 From France the journeys into Andorra could last between three and seven days depending upon the weather conditions. Despite being neutral, Andorra was under close observation from spies and agents from all belligerent countries. Many clandestine meetings are reputed to have taken place in the Hotel Mirador, where everybody watched everybody else! Radio Andorra, a powerful radio station that aimed to remain neutral, broadcast all over Europe and was greatly coveted by the Germans who dearly wished to purchase it or at least manipulate it for propaganda purposes – all to no avail, although they did succeed in gaining access to Radio Montecarlo. However, Radio Andorra did apparently provide a platform for some refugees to send coded messages in the form of dedicated songs, to their relatives in France. The Pat O’Leary, Dutch-Paris, Francois and the Marie-Claire Lines all used Andorran routes. Having been compromised in the lower and coastal regions the lines had moved inland to take on the high level routes where, it was rightly thought, they were less likely to encounter enemy patrols as the dangerous and difficult terrain was a deterrent to their pursuers. The Dutch-Paris Line had previously travelled into Switzerland until it was found that, if caught, evaders who entered that country were then likely to be interned for the duration of the war. Therefore the line changed direction to Toulouse, St Girons, Foix and, very often, Andorra in order to cross the barrier of the Pyrenees. Toulouse was a major gathering point for the crossing of the Pyrenees and many fugitives gathered in the Hotel de Paris, managed by Monsieur and Madame Montgelard, who were both eventually captured and deported to concentration camps in Germany; only Madame Montgelard returned. For evaders travelling from Toulouse, Andorra was the mid-point before they reached Barcelona. Both cities had large rail terminals and Barcelona had a very active British Consulate and a hotel structure of ‘safe-houses’ that provided evaders with the opportunity to rest, eat and organise themselves before the final leg of their journey to Lisbon or Gibraltar. A key organiser of the networks operating escape routes across Andorra was Francesc Viadiu who had been recruited in Montpellier by a British agent known by the name of ‘Mr Miller’. It was Viadiu who organised guides for the evaders, one being Joaquim Baldrich who, in his twenties, was a mountain guide and smuggler who assisted several hundred refugees to enter Spain. From Andorra to Manresa it took a strenuous hike lasting several days, followed by a train journey onwards to Barcelona where the evaders were assisted by the British Consul Harold Faquhar and the Vice Consul Jimmy Beaumont. From there passage was arranged to Lisbon or Gibraltar. Most of the guides on the Andorran routes were Spanish – often smugglers; sometimes their groups were quite large. Generally evaders were ill-equipped to take on the hazardous routes, however to dress for the mountains would have attracted unwanted attention as they traversed the lower, more populated, levels. Many routes started from Ussat les Bains and when there was no moon the mountain nights would be pitch-black. Sometimes the guides had their own deadlines to meet and if the evaders could not keep pace they found themselves sent back down the mountain or, at times, left behind to make their own way. Mountain huts were the only shelter from the hostile weather conditions where rain encountered on the lower slopes usually predicted blizzard conditions on the high peaks, an unwelcome accompaniment to the inevitable breathing difficulties brought on by the high altitude. 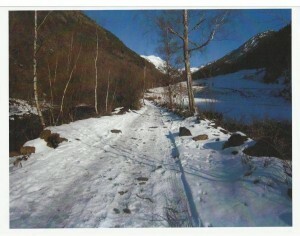 Many evaders and their guides died on the harsh Andorran routes. On the downhill approach into Andorra evaders often took refuge in farms and farm buildings where they were given shelter and food while the guides left to plan the next stage from Andorra to the British Consul in Barcelona. Once in Andorra there were good hotel facilities for shelter before the onward journey into Spain. Some refugees / evaders stayed a short time, others needed longer to recover their strength and prepare for the difficult journey ahead. Some of the hotels are still in operation today. Due to their unsuitable footwear, many evaders suffered from frostbite, which sometimes turned to gangrene. The local doctor, Professor Trias, was usually called to treat them or to arrange for hospital care. Once in Barcelona, those evaders with frostbite were taken by American cars to the British/American hospital in Madrid where they received further treatment before being moved to the British Embassy to await onward transport to Gibraltar and then England.